In a recent post I wrote about the Tour de Cape—the annual biking event here in Cape Coral that highlights the many miles of biking trails that the city has to offer. Many people—young, old, and families—participate in the Tour as well as enjoy year round biking here. There is another kind of biking that is paid tribute to here in the Cape as well…motorcycles! 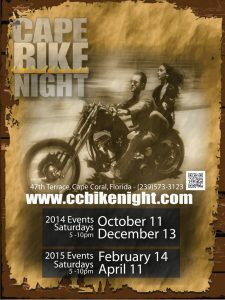 Cape Coral Bike Nights are another event sponsored by the Cape Coral’s Parks and Recreation Dept.. These nights are an opportunity for motorcycle enthusiasts to get together in downtown Cape Coral. Those who attend are able to listen to live bands, eat great food, and just have fun with others who enjoy motorcycles. There are 4 different bike nights held throughout the year—the second Saturday of October, December, February & April…that means that if you are still looking for something to do with your Valentine, you can attend bike night as the next one is scheduled for February 14th! Owning your own bike is not a prerequisite to having fun at this special event. Admission is free and it’s just a great way to get together with old friends or meet new friends. Several blocks of SE 47th Terrace are blocked off so that bikers can line the street with their bikes. Bikers and non-bikers can walk the street to see all of the greatest and latest makes and models. All kinds of food are available at the event or you can also take advantage of the many restaurants in this area of the Cape. In addition, many vendors set up displays for those who may be interested in buying gear or just want to browse. With or without a motorcycle, think about joining the fun in downtown Cape Coral to enjoy an evening of live country music along with about 12,000 other people from all over the area. Cape Coral’s Bike Night is touted to be the best bike night in SWFL…can 12,000 people be wrong? Check it out for yourself!